Some very bad, intentional, misinformation is being circulated today by email and on Facebook, about how the city manages it’s savings accounts, otherwise known as reserves. “Reserves” are a fancy name for savings accounts and the city maintains 12 different ones. Each has a different purpose but I’ll get to that below. In my view, the information being circulated is a very intentional twisting of the facts – maybe not quite a lie, but certainly “intellectually dishonest”. I’m sad to read some of the people lending their name to it. In the email version of this, one part says: “In 2011, $31 million was placed in unrestricted reserves because the city charged you more in taxes than they spent.” The email goes on to suggest that the city should use the money that went into those reserves instead to lower taxes. So basically what it’s saying is if we dumped out all our savings accounts (or didn’t add to them) taxes could have been lower which is true – it’s just very, very stupid. At the most basic level it’s good financial management to put money away for things that you know you’ll need down the road or to help out with unexpected financial expenses. This is what the city does with reserves. If that all makes sense to you then you can see how this info is twisting the facts and I’d encourage you to share this note with your friends using the share button below, or by copying and pasting this note in to an email to your friends. Don’t feel you need to read any further. Below I’m going to give you some examples about the details of what our reserves are – because I believe you deserve to have actual facts. Every year the city makes planned transfers to our reserves (deposits into our savings accounts.) Each one of these savings accounts has a policy that says exactly what it is intended to be spent on and in most cases how we will decide to add money to it. These policies are all publicly available on the city’s website here: http://www.cityofgp.com/index.aspx?page=786 Look at them for yourself. An example of one of these “savings accounts” is the Cemetery Perpetual Care Reserve. • It’s purpose is “to provide for the improvement, maintenance, management, control and operation of City cemeteries.” The expenditure guidelines state that the reserve is to be used “or the upkeep of the cemetery once it has been closed for future interments.” So yes, if we followed the suggestion in the email we could use that to lower your taxes next year but then there’d be no money to make sure the cemetery is cared for in to the future! • It’s there to “offset over-expenditures that may occur in the snow removal and ice control operating budget as a result of abnormal winter conditions.” Of course if we did that and then had a big snow fall year this year we wouldn’t have any money to call in additional contracted equipment or pay for overtime to keep staff on the road. What do you think? Maybe a good idea to have that savings account set up? • It’s really our “if things get bad” fund – there to manage “any annual operating deficiencies.” This is essentially a buffer for the city should we have an unexpected loss of revenue for any reason. It IS used to shelter you from big tax increases when unexpected things happen. For example we have used this fund this term to make up for losses of revenue that we had budgeted for. Specifically when the County ended their contract for fire services with the city and when Aquatera moved out of city hall and stopped paying rent. In 2011 those two items together took away $4 Million in revenue we were expecting but you didn’t see it drive up taxes, or force us to chop services in a knee-jerk fashion – because we were able to draw on the reserve. I could go on but I think you get the point. Anyone telling you that the city should drain it’s reserves to keep your taxes low is hoping that you won’t think for yourself. Really the whole thing is shameful. Last night council formally approved moving the annexation process forward by approving a final set of information sessions for the public. As the City’s media release below details it’s been a long process to get to this point, and there is still more to go before annexation is actually complete. Although the City “officially” initiated annexation back in early 2011 (by sending the County and the Municipal Government Board formal letters) I really view the process as having started back in 2005 or 2006. Back then Mayor Ayling’s council started a discussion about how the city would grow in the future and that initiated what would result in the 2008 Growth Study (PDF Download). Then, after the election in 2007, Mayor Logan’s Council started renegotiating the Intermunicipal Development Plan (PDF Download) with the County. 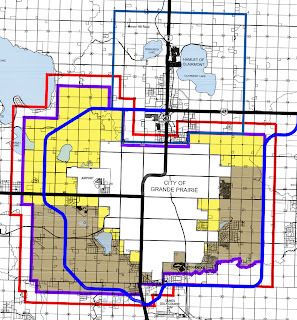 When it was completed, after nearly 3 years of negotiations, the IDP laid out the future annexation areas for the city in two chunks that were intended to provide for a “30 Year” and “50 Year” growth horizon. Then, shortly after the 2010 election – in the spring of 2011 – this current council sent the letter that started the direct negotiations and landowner consultations that we are just wrapping up now. Once the annexation is complete the city still has a lot of work to do to encourage growth and development of new tax paying properties in the new areas of the city. City Council recognizes this and we’ve started that work by recently adopting our Industrial Attraction Strategy (LINK), and beginning investments in the infrastructure that will help fuel development. So, we are nearing the end of one phase of what has been, and will be, a very long process in improving the City’s financial viability. • The City’s median age has risen slightly to 30.3. 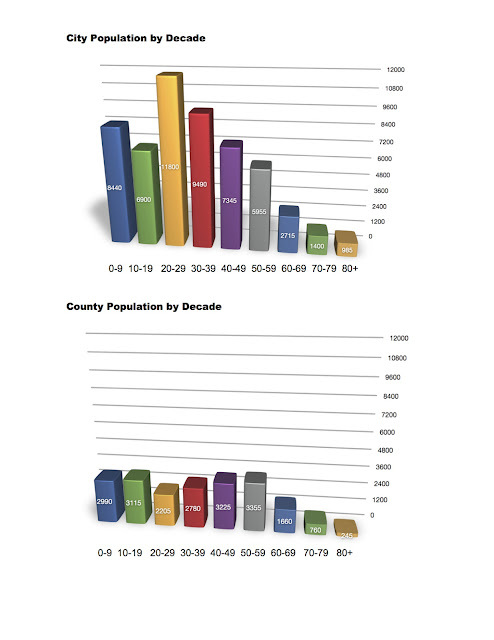 (the County’s median age is 36.8), which is still MUCH younger than Canada as a whole (40.6). The skewing of our city’s population obviously leads to some unique challenges (we’re going to need more schools for sure – especially a the elementary level) but I believe it also is one of the reasons our city is so dynamic and active. Now how’s THIS for entertainment at the Crystal Centre? “It’s a thrill to be able to welcome a star of Sir Elton John’s stature to Grande Prairie. His legendary performances have entertained millions worldwide and seeing him live at the Crystal Centre is truly a once in a lifetime opportunity,” said Grande Prairie Mayor, Bill Given.